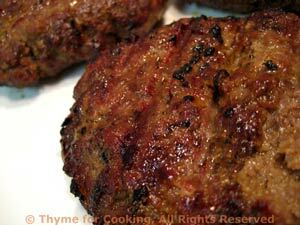 Thyme for Cooking Sunday Supper: Simple Grilled Hamburgers. Burgers and Potato Salad.... It's summer! I refer to this as 'American' potato salad because it is.... And because I also make different German and French potato salads. I know one is not supposed to mess with a classic, but I lightened it up a bit substituting yogurt for some of the mayonnaise. I use Dijon mustard because regular yellow salad or ballpark mustard is not available here. If you use salad mustard, I would use 4 tbs, rather than 3. This is enough for 2 meals. Slice the potatoes for salad and put in a steamer basket over an inch of water and steam over medium heat for 15 minutes or until done. When done, put the potatoes into a bowl and immediately drizzle with 1 tbs olive oil, stir to coat and allow to cool for 5 minutes. To make dressing: Put mayonnaise, yogurt and mustard in small bowl and mix. Taste - add more mustard if you like (I like a lot) or mayo or yogurt to get the flavor you prefer. Add most of the dressing to the potatoes and mix lightly. 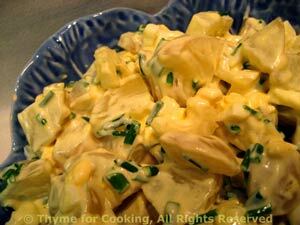 Add celery, eggs and chives, stir to combine. Add the rest of the dressing if needed - to your taste. Serve. Note: The yogurt adds a nice, tangy flavor and keeps the calories down a bit. 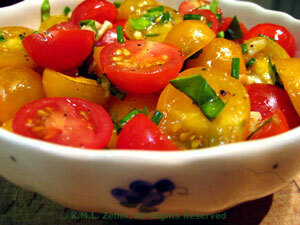 If too thick you can thin with a bit of milk or cream or olive oil.